Visteon workers have issued this leaflet to encourage supporters to join their 24hr picket of the factory. Come to the factory anytime! 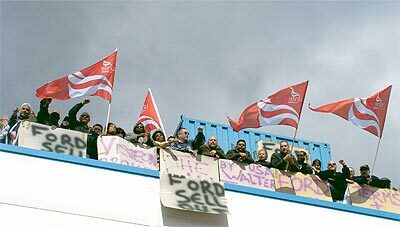 How we took action We, the Ford Visteon workers, occupied our factory on Wednesday 1st April. The previous day in a meeting lasting just 6 minutes we were told that the European company, with plants in Belfast, Basildon and Ponders End, Enfield, was going into administration and that we were to leave - without our wages being paid. Personal possessions could be collected the next day, but at 10 o'clock the factory was locked closed. Workers had already occupied the Belfast factory, and are still in. We demand what is due to us The 200 workers who are part of the Ford subsidiary want the same conditions they have always had via "mirror contracts" with the parent company. Up to now they don't know when they will get wages due, and their pensions are to be controlled by the government Pensions Protection Fund. This means a maximum of £9,000 payout, and much reduced conditions! Some of the women and men have 40 yrs service! The move is to save Visteon USA money at our expense. But unexpectedly Unite union members have taken determined action that bosses thought they had eliminated years ago. The workers want their existing terms respected. Ford Visteon can't be allowed to avoid their responsibility. Negotiations have now started As a result of the occupation Visteon agreed to negotiate with us - our convenor flew over to the USA this week to meet US company reps. More discussions are due this coming week. The future? As well as proper redundancy payments, some are suggesting that our skills - we can make anything in plastic - should be used to make increasingly needed parts for green products: bike and trailer parts, solar panels, turbines, recycling bins etc. Government investment in this rather than throwing money at bankers could be profitable & save jobs in the long term. All support welcome Ford Visteon workers have been pleased at the support received from other Ford plants throughout the UK, and from workplaces and community groups all over the world. Hundreds of supporters have attended our rallies outside. This is a fight we can win. We're off our knees and fighting fit!